Today, October 11th is the first day of the Year of Faith. It is also the 50th anniversary of Vatican II and the 20th anniversary of the publication of the Catechism of the Catholic Church. The Church asks all Catholics to deepen their faith during this year. Prayer, frequent use of the Sacraments, Mass, the Rosary, the reading of Sacred Scripture and the Catechism should be part of a daily routine. The reading of other materials that promote orthodox Catholicism should be used as well such as books on spirituality, apologetics, philosophy, theology and the like. 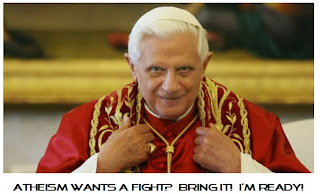 Our Holy Father, Pope Benedict XVI wants to counter the secularism that is poisoning society. Atheism and Humanism are spreading in schools and governments. Our youth are being pontificated to and pushed away from faith with ideas that seem to be rational and sound interesting. They are taught confusing ideas regarding God, religion, personhood, government, and politics. Youth are entering college as believers and leaving it as Atheists. This is due to the poor catechesis they received. When a tree does not have strong roots, it will die. Our youth must be taught the Faith well so they will be able to hold on to it and defend it against any philosophies and ideologies that challenge it. Atheism and other ideas are presented as academic and an alternative to the "superstitions" of man, as they call religion. When the youth are not grounded well in faith, they begin to accept whatever is pontificated to them. Atheism to them seems truthful and invincible. In reality, Atheism is merely fallacious rhetoric which bases itself on speculative reasoning. All Catholics should learn their faith or relearn it well. They should be able to provide a reason for the hope that is in them as St. Peter the first Pope tells us in Scripture. Let us take this year to grow in Faith and return the challenge to Atheism, Humanism, Pro-abortion, Moral Relativism, Hedonism, Homosexuality etc.